CAMBODIA, FOR YOUR GOOD …. “Celebrating the Treasures of Asia” was the theme of the tenth edition of Corporate Travel World (CTW) and the fifteenth edition of Incentive Travel & Conventions, Meetings Asia (IT&CMA), which took place this fall in Thailand. After a two-year stop-over in Pattaya, the organizers TTG ASIA moved back to the capital Bangkok where the Doublebill event now found a home for 5 years in the centrally located Bangkok Convention Center in the new Central World complex. Clearly an excellent choice. The Land of the Smile has definitely recognized the economic impact of the MICE market segment: for 2008 they are looking at 800.000 visitors in this segment alone, representing an increase of 18% from the figures in 2006. TCEB has launched a new campaign with the slogan “A new experience for meetings” aiming at doing even better in the coming years. 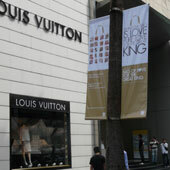 This campaign was officially introduced at EIBTM in Barcelona, where Thailand was prominently present. 16 esteemed guest speakers from Asia, the Pacific Region, the United States and Europe attended the CTW conference whilst 320 exhibitors from 30 countries showed their products during IT&CMA. The big absentee at the exhibition was China; a logical result of the success of the first edition of IT&CM China, in the spring of 2007 in Shanghai: a subsidiary of IT&CMA that is already announcing an increase of 50% for 2008. Another, less agreeable surprise was the lack of interest from Belgium for IT&CMA this year. Only 2 incentive specialists and 1 corporate buyer were present, not counting two freeloaders who managed to wriggle their way in. In order to avoid this sort of unwanted visitors, IT&CMA have decided in the future to work hand in hand with the specialized professional organizations and press when selecting hosted buyers. 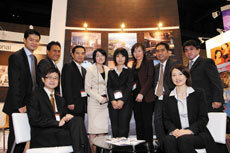 The second edition of IT&CM China will take place from April 8 till 11th 2008 in Shanghai. Info on www.itcmchina.com. The sixteenth IT&CMA and eleventh CTW will we held in Bangkok from October 7th till 9th 2008. 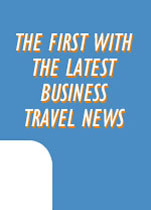 Info on www.itcma.com.sg and www.corporatetravelworld.com. After the visit of the MICE fair IT&CMA in Bangkok in October of last year, there was a choice of post tours that participants could chose from; I personally choose to go to Cambodia. I remember Cambodia as being one of the countries most spoken of during my childhood. Unfortunately the stories then told were not that nice to hear. They dealt with Red Khmers, 1,7 Million of dead people and what seemed to be an endless war. Nothing of all that characterizes the actual Cambodia. The country not only managed to get out of its desperate situation but put itself in the tourists top 10 ranking of countries to explore in the coming years. So, curious as I am, I decided to have a look at it myself. The following lines are a brief reflection of my inner feelings, my thoughts and my devotion to the Khmer people, all gathered in a 4 days stay in the lovely but very poor Cambodia. I flew in from Bangkok with an Airbus of Bangkok Air. This company operates several daily flights to Siam Riep. The journey only takes 1 hour and brings you to a small airport near the Angkor temples. Be prepared however: do not only have your passport in your hands but do not forget about a 20$ bill and an extra passport photo needed for immigration services. Do not rely on a photograph machine in Siam Riep, as no such wonder of our time can be found at the airport. No photo, no entrance: keep it in mind. 8 (yes eight ) immigration officers deal with your request to enter the country. Your passport seems to burn like hell in their hands as they all throw it to each other in stead of passing it around whilst their faces tell you they never learned how to smile. You feel extremely welcome!!! The “ bienvenu” sign which relates to ancient (better ?) times allows you to step into another Cambodia though : a country of smiling faces and helpful people. It took me about 15 minutes to get to the hotel, located, as all major hotels, just outside the city borders. The hotel characterized by a huge, roof topped reception area, a lovely garden, a landscape swimming pool, a spa, and 48 m² rooms. Although the rooms were large I could only locate 2 drawers and a few hangers in it, which were not enough to enable me to store all my personal belongings. Oh yes, no need at all to change Euros into local currency; all rates are indicated in USD and the green one has become the national payment currency. The hotel seemed to be invaded by Japanese, Korean and American tourists. Nothing to worry about though: you only see them between 06H30 and 07H30 and maybe at night. During the daytime they are all gone to the temples, which on Day 2 was exactly what I was planning to do. Before that however, I went, accompanied by a guide and some friends, to visit the floating houses. These creations made by fisherman of whom I hope they are more experienced at catching fish than at building houses, can be found at the Tonle Sap Lake. Well they usually can, because at this time of the year, mainly due to the excessive rainfall during the wet season, the Lake invaded the rice fields, reshaping them into a large swamp on which thousands of these floating houses can be found. A flat bedded speed boat brought me to the border of the lake in about 20 minutes. All that I saw in this time span was poverty but also great happiness and friendliness. Amazing to notice, once again, that the less people have, the more they want to share it with you. 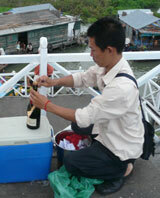 To my astonishment we were served French champagne accompanied with freshly cooked shrimps. It felt a bit strange having to taste these culinary highlights being surrounded by children floating on the water in what I’d call large wash tubs, trying to sell bananas and small fishes to you. A very dangerous operation by the way as crocodiles appeared not to be that far away. The feeling gets a little bit better though once you realize that these people get some extras thanks to the presence of the tourists. On Day 2, I went to the Angkor temples, well, only to 3 of them. The temples are widely spread in the area and it would take a couple of days to visit them all. As my guide, a former soldier who beat the Red Khmer, took good care of me, I only went to the temples in the early morning and late afternoon. (the combination of sunshine, humidity and mass tourism would have been a killer for me otherwise). Lots of stones to see but… after a while they all look the same…so, make sure your travel organizer is OK, because the quality of the guide at your disposal is extremely important. He really makes the difference at the end between a boring or an exciting experience. 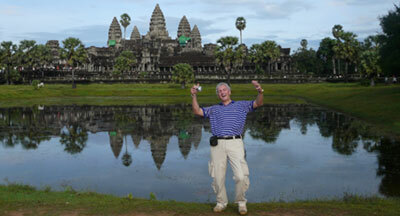 If you don’t want to be photographed yourself than just don’t go to the Angkor temples. It must be one of the most photographed places worldwide. Some 50000 tourists a day each shooting about 80 pictures at least…so no chance at all you won’t figure on one of them. If your legs feel a bit tired then go for an elephant ride (+/- 30 min ). Do not forget the drivers’ tip which can easily be put in the extra pocket at the back of the boys’ shirt. Believe me, Angkor is really a place you should visit in ideal circumstances. Last but not least, the host cities for future conferences were announced: Torino, Italy will be the 2009 host city for the newly named The European Meeting and Event Conference; Malaga, Spain will be the 2010 host city for The European Meeting and Event Conference and Atlanta, Georgia will be the 2009 host city for Professional Education Congress-North America. Although more than 20 years passed by since my last ride on a bike, (shame on me), I decided the next day to go for a bike ride to the neighboring villages. Well, in fact we were 3 to go for the bike ride, accompanied by 1 guide, 1 technician on a bike, one truck with spare bikes and a mini van for those who’d decide to continue their journey from a certain point in an AC environment. What a wonderful experience this ride was. Although I was a little bit surprised to get a MB at my disposal I never blamed the bumpy muddy “roads” I had to drive on. The scenery was really overwhelmingly beautiful in its simplicity, in its friendliness and in its purity. Yes, I noticed poverty and yes, I even noticed misery, but above all I noticed human dignity. These people, these simple open hearted people, smash you into reality and in the real values of life. It’s amazing to notice for yourself, stretched out on your bed at night, thinking about those experiences, how simple and beautiful life can be. This is what I remember most about Cambodia. The Angkor Temples and the five star hotels just vanish in the shadow of those lovely people. 1/ Siem Reap and Phnom Penh are the most developed in terms of tourism infrastructure such as hotels, restaurants, incentive party venues and services while Sihanoukville is catching up fast. 2/ The government is also promoting Ratanakiri and nearby provinces as an ecotourism area. But given limited tourism infrastructure, the area’s potential as an incentive destination is still slim. 3/ Mid-October to mid-April are busy months throughout the country and all hotels in Siem Reap, Phnom Penh and Sihanoukville will be running at high occupancies. Advance bookings should be made for events planned during this period. 4/ For budget-consious groups, mid-April to mid-October is the ideal period to hold an event because it is the low season and average room rates, especially in mid-range hotels, can drop by as much as 50 per cent compared to the high season. 5/ Visas can be obtained on arrival at the international airports and designated border checkpoints. Its costs US20$ for a tourist visa and US25$ for a business visa. A passport sized photograph is required. 6/ Room rates in the three key tourist destinations are expected to go up by at least 5 to 10 percent annually if current demand keeps up. 7/ Most DMC’s and hotels usually target small and medium size meeting and incentive groups of up to 150 people as there are no hotels that can house more than this number under one roof. 8/ For corporations and incentive planners who have a policy about corporate responsibility, there are various meaningful ways of helping Cambodians. Activities include building schools, houses, wells, etc. Most DMC’s and hotels can come up with a programme. 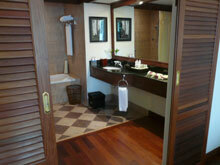 9/ In Siem Reap, there are about 94 hotels and around 6,800 rooms. However, only about 20 hotels and around 1,000 rooms are four-and five-star properties. 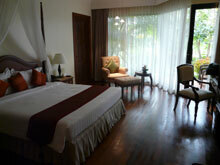 10/ Room rates in Siem Reap’s mid range hotel cost between US50$ and US80$ a night. Average room rates in five star hotels are between US130$ and US250$ a night. 11/ Sokha Angkor Resort has the largest ballroom in Siem Reap and can seat up to 400 people theatre-style. 12/ Cambodia’s first MICE venue, Angkor Coex Convention and Exhibition Center, is in Siem Reap. Measuring 8,000m2, it was opened in November 2006. 13/ Siem Reap’s second international golf course, designed by Nick Faldo, is slated to open this year and will include a 1,600m2 convention centre. The first was the Phoeethra Country Club.